I love this quilt. It is light weight so you don't get hot a night. The quality is great and like I said super light weight. It goes in my 5 year olds bedroom. Add Scandinavian style to your home with this reversible quilt set featuring stripes of various geometric patterns. This 3-piece set includes a soft cotton quilt and 2 matching pillow shams. Use this set to redecorate your master or guest bedroom. Reversible Machine Wash Cold With Similar Colors, Gentle Cycle. Well made quilt set! Perfect for Florida weather! Would definetly recommend to a friend! 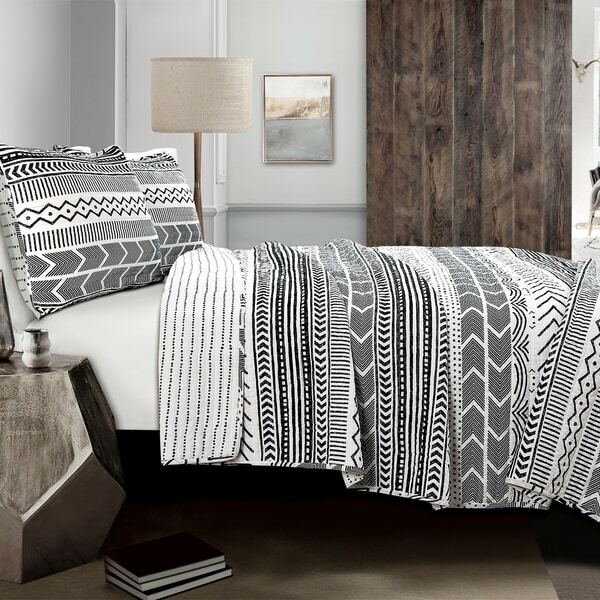 This quilt set is a great addition to our master bedroom. This is a nice quality quilt. It came just as expected/pictured! I love that it is reversible too for different options. I love the pattern! This is soft warm and beautiful. The colors are great and the quality is great! I love quilts and this one was a great addition to my collection. The quilt is very warm and gives you the feeling of wrapping up in bed at grandma's house as a child. The pillow cases are nice as well, but they do feel just a tad rough on their face. I'm running them through the wash again with some fabric softener hoping that they will soften up a bit more. Beautiful set - it was purchased for our master bedroom. I like how light and warm it is fro AZ weather. With its colors it doesn't clash with anything else in the bedroom. Being machine washable and breathable cotton were a huge plus. It's a good size for our king size bed but I had to turn it sideways to have the sides nicely covered and the back of the bed. Such an interesting print, I love it every time I look at it. Have a pillow top queen mattress and bought the king set of this so it would cover, does the job perfectly and there is not fabric swimming on the floor. Light enough for steamy Florida weather but with enough heat to keep you cozy in the air conditioning! We purchased this quilt for my daughters room. It is a very nice quilt and the quality seems nice. My only complaint is that the black has faded a bit with washing. Otherwise, we love it! We purchased two sets for our lake house guest room. Since they state they are queen/full I was afraid they might not be big enough… They are absolutely perfect, very nice quality, and look beautiful! Beautiful cotton quilt, but be careful when washing it so the black doesnt fade to grey. It is super soft, and perfect for warmer evenings. I would surely buy again. Not very soft material. If using it for style, then it works. I bought a king size for my king size bed, it seems too small. Kept anyway. Love it! looks really nice.. nice weight and machine washable. It’s a little thinner then I’d like. But if you are looking for light weight then this is great. Love the pattern. Not as textured as it looks in the photo though. Good size.